These experts address how a new emphasis on effective policy design has re-emerged ​in public policy studies in recent years ​and ​clarify the role of historical policy decisions, policy capacities and government intentions in　promoting a design orientation towards ​policy formulation and policy-making more generally. They examine many previously unexplored aspects of policy designs and designing activities, which focus upon analyzing and improving the sets of policy tools adopted by governments to correct policy problems. 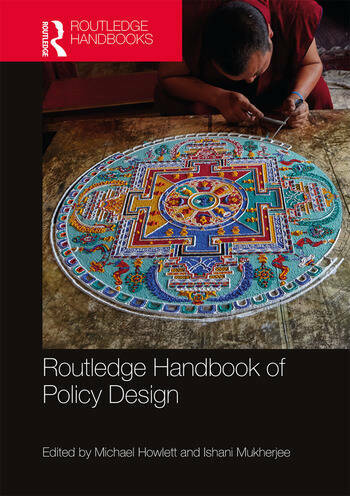 Ranging from the fundamentals of policy design and its place in greater policy studies, to new questions regarding policy design content and ​effectiveness, to contemporary design trends such as the use of digital tools and big data, the Routledge Handbook of Policy Design is a comprehensive reference for students and scholars of public policy, public administration and public management, government and business. Michael Howlett is Burnaby Mountain Professor and Canada Research Chair (Tier 1) in the Department of Political Science at Simon Fraser University, Canada. He specializes in public policy analysis and resource and environmental policy. Ishani Mukherjee is Assistant Professor of Public Policy at the Singapore Management University. She specializes in the environmental and energy policy domain with an emphasis on policy instruments for resource sustainability, renewable energy and energy efficiency.